Chaim Gurland was son of a zealous Rabbi in Vilna, Lithuania. When he was able to read the Holy Scriptures, he loved the narratives of Elijah so much that one day he ran away from home "because he wanted to go up into heaven like Elijah"! It took days before the half-starved boy was found. In his youth Chaim had an unfortunate experience. In a biblical narrative he saw a picture of the crucified Christ which he wished to impress on his mind; he therefore sneaked into the attic and made a copy of the picture. This took many hours and his parents went in search of him. At dusk his father, shaken and disappointed, suddenly stood beside him. In his eyes Chaim had committed a terrible crime. He rebuked his son severely and gave him a good hiding. Chaim was destined to become a Rabbi. After three years of study at a Rabbinical Seminary he was inducted. Of the day of his induction as Rabbi he wrote: "It was the most terrible, the most unhappy day of my whole life." He had great doubts as to the divine origin of the Talmud, but in obedience to his parents Chaim took that road, knowing well that it could not satisfy him. His conscience troubled him much; nevertheless he accepted the call as Rabbi at Wilkomir. What now? For some years he made a meager living as a private teacher. Then a Jewish peddler, one day, brought him a Hebrew New Testament. Now the ex-Rabbi read for the first time the Sermon on the Mount, the epistles of Paul and other passages. His reading led him to new doubts and great sadness came over him. Soon he heard of and became acquainted with Pastor Faltin who was in contact with many Jewish people in Kishinev. Pastor Faltin called on the Rabbi, who warmly welcomed him. Mr. Faltin remarked: "I am good at drawing and would be pleased to give you drawing lessons and German lessons if you in turn would read with me the Hebrew Bible once a week. I should like to improve my knowledge of the Hebrew language." The Rabbi agreed to this. In the course of their reading they came to the fifty-third chapter of the book of the Prophet Isaiah, which is one of the most wonderful portions of the Bible. Many Jews never read that chapter; they are afraid of it, for they know that the Christians say it describes most clearly the manner and meaning of the Messiah's sufferings, death, and resurrection. Strange to say, the Jews do not wish to hear that. Rabbi Garland therefore asked Pastor Faltin not to read the fifty-third chapter. Pastor Faltin said: "I shall pray that God may give you courage to be willing to know God's saving truth." From that time the Rabbi could not help thinking about that remarkable chapter, and felt that it was cowardly to be afraid to know what God had revealed in it. When Pastor Faltin went back the following week, Rabbi Gurland expressed his willingness to read the fifty-third chapter with him. Pastor Faltin said: "Let me first read to you the story of Christ's sufferings, as contained in the New Testament." After that was done, they opened and read Isaiah fifty-three which was written more than 700 years before Jesus Christ was born. Rabbi Garland admitted that this chapter was a perfect picture of what Jesus had suffered and acquired for us on Calvary. The two men had many discussions. Pastor Faltin was in no hurry, but eventually Garland desired to confess the Lord Jesus Christ in baptism, and after ample instruction in the faith the 33-year-old Garland and his wife were baptised. The excitement and indignation of the Jewish population was terrible when they heard that Rabbi Garland was going to be baptized in Pastor Faltin's church, and thus confess publicly his faith in Christ. Many Jews were so enraged about Rabbi Garland's intention that they wrote to him that his baptism would be a disgrace and a calamity to the Jews. They told him that a number of Jews had sworn that, if he dared to go through with it, they would kill him in the church after his baptism. Pastor Faltin asked the Rabbi whether he would prefer to be baptized quietly in the manse. The Rabbi answered: "No, Jesus Christ is a living, mighty Saviour. He can protect me; if He does not, I am willing to suffer, to die for Him." When the day for the Rabbi's baptism came, the Jews were terribly excited. The church was overcrowded with Christians and Jews. The service went on quietly. The minister preached Christ, who came to seek and to save that which was lost. Before the baptism, Gurland gave a short address, in which he stated how he received the heavenly light through reading the fifty-third chapter of Isaiah and that he believed Jesus Christ to be the promised Messiah and Saviour. During the act of baptism and the rest of the divine service, everything was quiet. Jesus once calmed the raging sea: now He pacified raging hearts. After the service an elderly, motherly lady told the new Hebrew Christian: "For 18 years I have prayed to God and pleaded with Him to save your soul." Now a new training began. 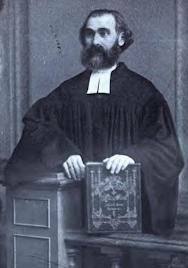 Rudolf, as he was called since the day of his baptism, studied theology in Berlin and was later ordained as a Protestant Pastor. That day he preached on Romans 1:16, "I am not ashamed of the gospel of Christ: for it is the power of God unto salvation to every one that believeth; to the Jew first, and also to the Greek." He became co-Pastor of his friend and spiritual father, Pastor Faltin in Kishinev. This did not cause him to forget his brethren of the house of Israel. He often had talks with them, led many to the Saviour and baptized them. His work became well known in Germany and in Russia. A few years later the Church of Kurland called him as their Missionary to the Jews. In this capacity he held Bible classes for Jewish people, had a large correspondence and was enabled by the Spirit of God to lead many to the Lord. There were many disappointments in the work, many tests and struggles, but Gurland was able to sow love for the Jews and for work amongst them in the hearts of many Christians, and to show many Jewish people the way of salvation. Gurland said, "Often God gives only enough light for one step at a time, but to the faithful a glorious end is assured, for God wonderfully leads him from dark­ness to light." The ex-Rabbi lived in two worlds. Time and again he kindled flames of love in the hearts of Christians for God's ancient people and for service to them. Time and again he called his Jewish brethren to the Messiah Who has died for all, Jews and non-Jews.